The early origins of this church in Kelston, situated close to Bath and Bristol, are shown by the remains of a Saxon cross shaft lying to the north of the alter. "The church, dedicated to St. Nicholas, is a stone structure with tower containing four bells. The church was rebuilt in 1860. 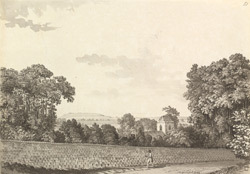 In the interior are the tombs of Sir John Harrington, the poet, author of "Oceans," and godson to Queen Elizabeth, Henry Harrington, M.D., the famed musician, and Sir William Cockburn, Bart., Dean of York. The register dates from 1538. There is a parochial school, with the endowment of £5 per annum, for both sexes, also a Sunday-school." Extract from The National Gazetteer of Great Britain and Ireland (1868).